Not sure why this room had been neglected for so long. One day I got up the nerve to email Holly Mathis. I thought if anyone could help me, it would be her. And yep, she rocked it. and kindly I might add. Here is what I started with. Not horrible, but not great. The color was Fossil Beute by Ralph Lauren and it was a suede look. The nightstands were too small and while the chandelier was ok, it didn't really fit the space. Would you like to see the after? I thought today I would just show photos and tomorrow I will follow up with details. A huge thank you to Christine, the owner at Trimood Photography for taking these photos! And, how would one of you like that sign I have above my bed? The owner and artist at Pink Marmalade Designs has offered one of them to one of you lucky My Sweet Savannah Readers! All of their signs are handmade with love right here in the USA! Leave me a comment on this post and you'll be entered! I will announce the winner back here on Friday along with the custom pet portrait winner from yesterday's giveaway! I hope you enjoyed the new and improved master bedroom! LOVE the room makeover!! What color are your walls? They are gorgeous!! Love this room, can not wait for all the details!!! Oh my! You went from great to fabulous! Loving the words and those pillows! I need Holly Mathis at my house! What a fabulous room, who wouldn't want to spend most of there day in there! I need someone to do a makeover on my bedroom. Love it all. I love your room!! It's so beautiful and looks like a very relaxing space. Perfect! I really love your room! I like that you've got carpet with an area rug. I'm a fan of carpet (for softness and noise control) in bedrooms. So beautiful, where did you get your bedding? It's perfect! I have the same bed and can't wait to see more details! Wow, what a difference. It is beautiful. So inspiring to make some changes in our master bedroom. Thanks!! It looks perfect! I have the samething going on at our house, our room is the last one to get decorated! That adorable print might just be the motivation I need! Wow wow wow!!!! Love it! And love the sign too!!!!! Beautiful room and love the sign. Love the sign, love the color of the room. The bedroom makeover is fabulous!! So elegant and a lovely place to relax!! That phrase means so much to me and my husband! I'm praying I can hang that beautiful sign in my house too! Its absolutely perfect!! Love your room! Such a beautiful space! The bedding is perfect. Awesome room! The bed looks so inviting. You are still in my prayers that you find your sweet dog! Oh my goodness, your room is beautiful!! It's so elegant and romantic now. I love the signs and the monogram. Just beautiful! What a gorgeous room! I am always scared to do dark walls but these are amazing! I love all of the small details. 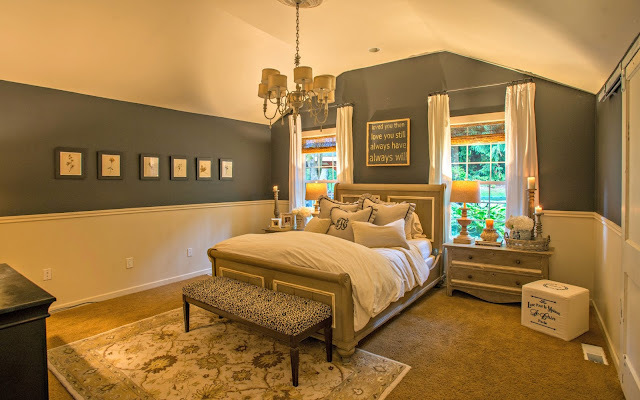 Gorgeous bedroom, thanks for sharing! Love your bedroom male over, Holly Mathis is awesome! Totally different walls than I would have expected but totally works. I'm lovin it. I would love to win that sign and hang it above my bed. I am in love with your sliding barn type doors. Cannot wait to read all the deets. Absolutely stunning. Love the walls. It is easy to get into a rut, but you are clearly out of one. Love the room! Love it! What's the wall color. 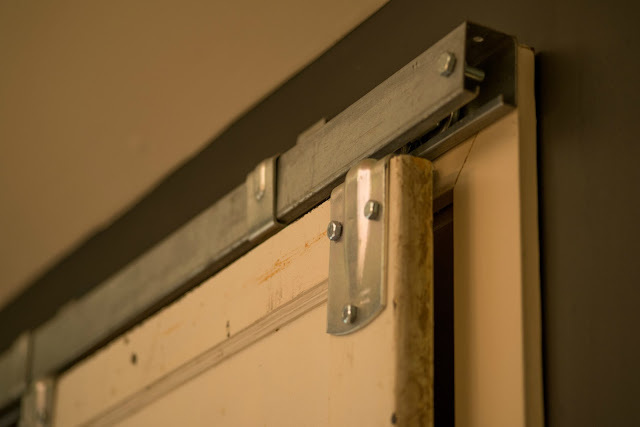 I've been trying to find a place to do the sliding barn doors too. Would love to win the picture to hang over my bed! I'm in the middle of redoing my master bedroom and stuck on how to decorate above bed...love this! How beautiful! 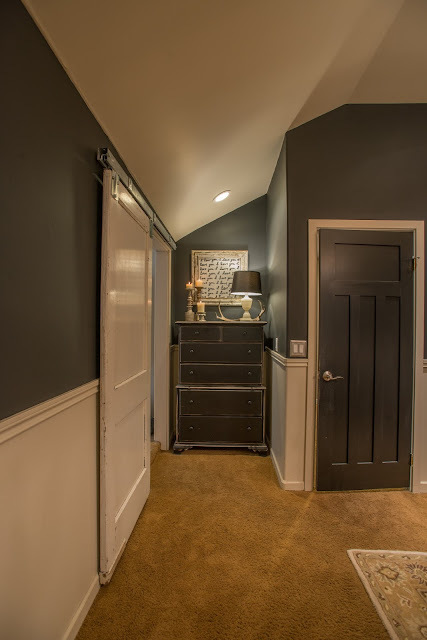 Love those barn style doors, and your color scheme is to die for! What a beautiful bedroom! I love it and the sign above your bed. Thanks for the chance to win. I love the color scheme! It has inspired my to finally get started on out master bedroom. Super pretty room!! I'm moving on Saturday and am collecting ideas!!! It's beautiful! Can you post on what it's like to work with a designer? Did she visit in person? Do you give a budget? 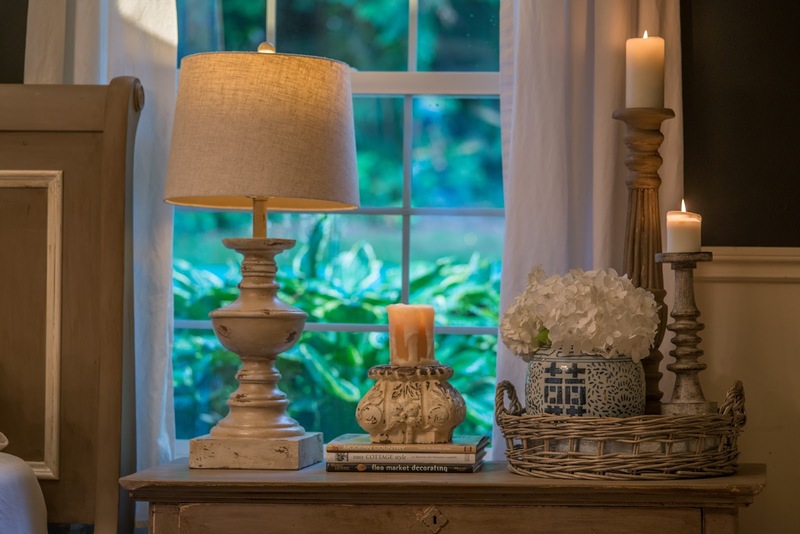 Do you receive recommendations of actual items on the market to use in your space? I've thought about doing this before, but I'm not sure how the process works. 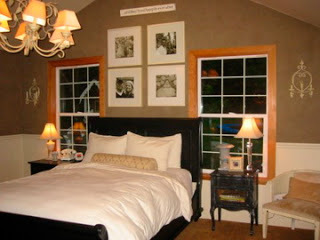 Love your updated bedroom and looking forward to sources and paint color. Beautiful transformation! Holly Mathis is great!! Gorgeous! Can't wait for the details! Love the makeover, can't wait for the details. Your room turned out beautiful.. Thanks for sharing. I also love the barn doors. Love the sign also. Thanks for the chance at this giveaway! Beautiful room that is very cozy and inviting. LOVE everything...especially the barn doors! Love the room and the sign! I love what you two did to transform your room! Well done....you inspire! Thanks for sharing. And I'd LOVE to have that wall art! Totally love how the room turned out! It looks much bigger with just the paint adjustment! Can't wait to see the details of how you finished off the look. Beautiful! I love the barn doors! Just gorgeous!!! I LOVE Holly's work!! Very pretty! Holly does great work. Love how your bedding turned out and the artwork over your bed. Perfect for a bedroom! What a beautiful makeover. I love it! Just beautiful. Moody and spa like. Luv the barn doors! Oh it looks gorgeous!!! You and Holly did an amazing job! I love your bed colors and the monogram pillow...so soothing! What a great master bedroom! Love those sliding barn doors. I would love to be entered in your drawing for the sign over your bed! My hubby and I celebrate our 30th Anniversary today, that sign says it all for us! The room looks amazing and that sign is beautiful! You and Holly nailed it. I love Holly's designs. Your bedroom looks amazing! Thanks for the sweet giveaway. Love everything! Love the sign! I would love that in my bedroom. Love the room and love the picture! Your bedroom looks amazing! And what fun artwork! Omgosh! That looks amazing! 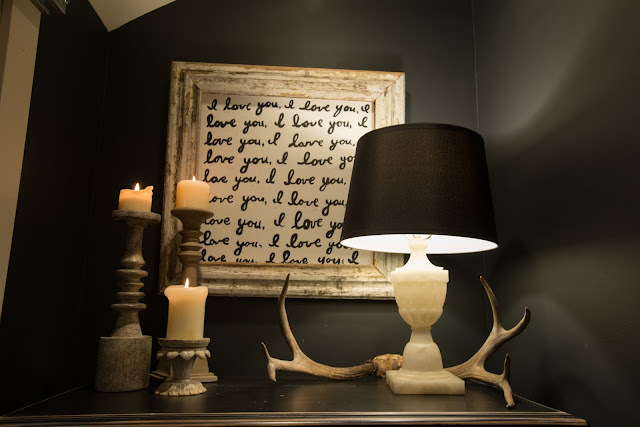 Love the pillows and the I love you print over the dresser (I'm suspecting it's fabric framed?). And I would love to win the print over your bed!! Gorgeous girl! 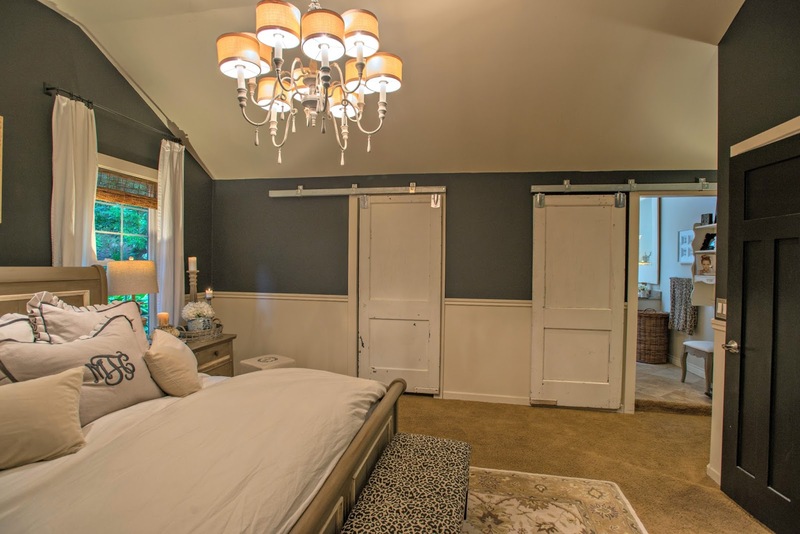 Beautiful--I so want a barn door in our bedroom! Thank you for the giveaway! The bedroom transformation is fabulous! Very pretty room! I love that dark color with the white, and love the ruffled pillows. Stunning makeover!! The sign is so tender and loving! BTW - what is the wall color?? Absolutely beautiful makeover! Can't wait to hear the details. Love the sign above the bed and the I love you one. I've been looking for a similar sign to go above my bed. Looks fabulous! Love the make over...and I love the sign! What a great bedroom. Love! Your bedroom looks so beautiful and romantic! It looks like a cozy space to hang out in too! What a lovely room! Can't wait to read about the details! Love everything about it! I would love that sign. I have been all over the place with my room and this inspires me. Thanks! Hi Melaine, I LOVE your bedroom make-over! not that it needed it, it was lovely before! They say a bedroom should be your sanctuary......I'm sure this must feel like that. The color palette is very soothing and calming! Beautiful! I am so jealous of your room makeover! My master isn't even as good as your before! I swear in each house we've lived in (5) my master is the last to get TLC (if ever)! Love all the dark and white. LOVE. Melaine, I'm just stunned at how beautiful it all is. You are beyond talented. Congrats and sweet dreams! I would love win this. I need to figure out what to do with my bed room!!! I love everything about your room! It looks huge!! Love the room, and adore the sign! My husband and I have loved one another since we were twelve years old! Three children and over twenty years of marriage I still love and adore him! Great room!! 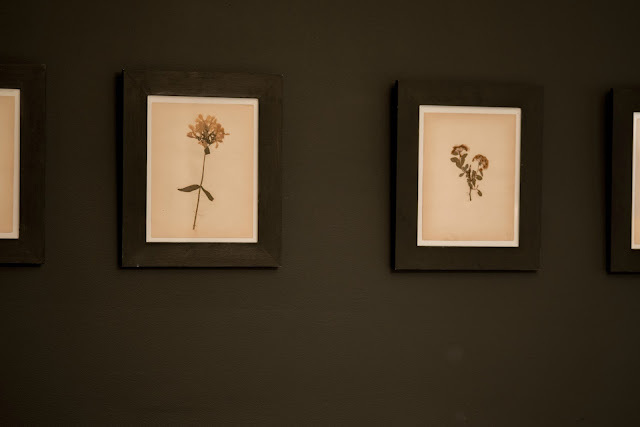 We have darker walls in our master and love it! LOVE!!!! !Is your bed a queen or a king? Love the room, but I really, really love the sign! My husband and I have loved one another since we were twelve years old. Three children and over twenty years of marriage and I still love him just as much, actually more! So pretty, love that wall color! 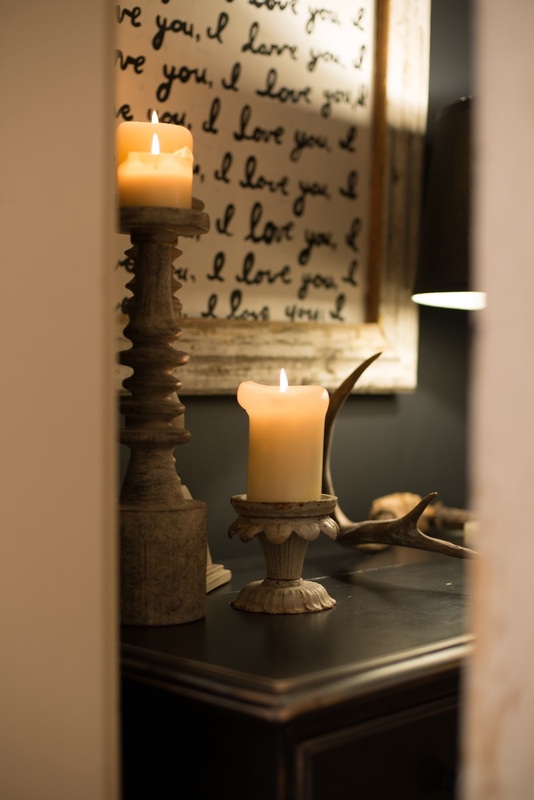 Love all the details you always add to all of your rooms. I love this sign and what special meaning it has to a couple, it would be the perfect detail to our master bedroom update. Can't wait for all of your other details. Thanks Melaine for sharing. Love the makeover and I love the sign!! Love it! Love the color...can't wait for the dets! Very pretty, what a nice retreat at the end of the day! Beautiful room. Love the sign! Beautiful room and I love the sign! Beautiful room! Such wonderful colors. Can't wait for the details! Absolutely fabulous! 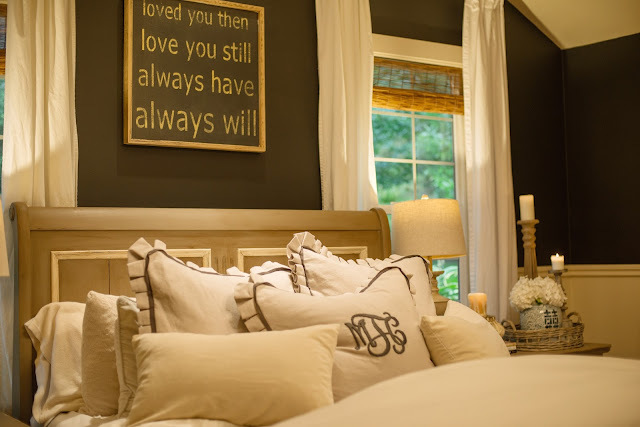 The bedroom is beautiful.....love the signs, so sweet for a master bedroom! Total swoon! Can't wait for the details. Love the sign! Great sign. Loving the transformation! We are about to transform our wallpapered bedroom! Gross! I will use this room for inspiration! Love the reveal! I've seen the I love you board on Pinterest. I'm betting you made it so I am anxiously awaiting that tutorial! Love everything about the room, the sign looks great above the bed! Beautiful, Melanie! 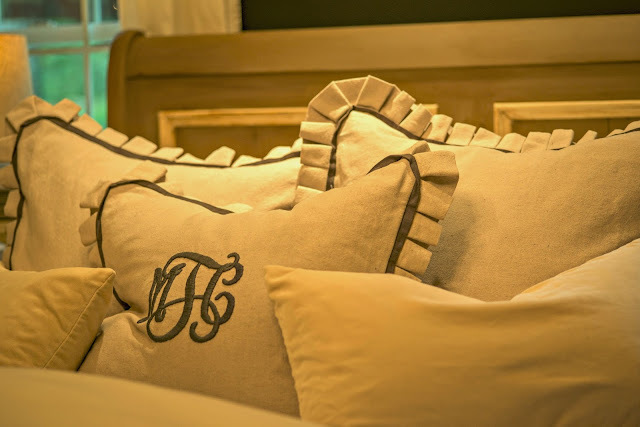 I love the dramatic dark walls, and I think your ruffled monogrammed shams are my favorite little detail. What a cozy space to curl up in! I love your room makeover! 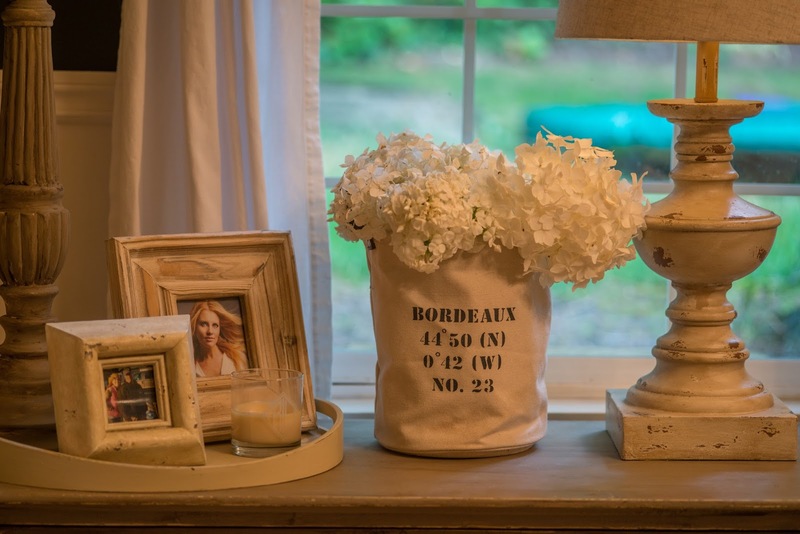 The color, the barn doors and the sign for giveaway! So sweet! Hope to win! Thanks for the chance! What a pretty room! I love the ruffled shams! What a beautiful space!! Loving the word art. You did a great job putting it all together! Your bedroom is dreamy:) love it! Love how your room turned out!! Beautiful!! I would love to win a sign. I know exactly where I would put one of those beautiful signs. Fingers crossed. Love your new room! I have a bed just like yours that I don't know what to do with. I loved that you painted yours! Love the color, candles and the sign! It is romantic and rustic....awesome. I love the sign above your bed. It would be wonderful to win it. So amazing that you are giving one of those signs away because as I was looking at the pics of your new bedroom redo, I thought, "Oh, I would love a sign like that!" Beautiful room...so serene! Makes me want my own master re-do!! DiD love him then and DO love him now!! what a cute sign!! Love your bedroom and the sign...great job! absolutely beautiful! I cannot wait to hear about this. And that sign, oh my it could not be more perfect! I LOVE LOVE LOVE that sign!!! And the ROOM is unbelievable!! beautifulness! thanks for the giveaway! Tears to my eyes when I read the sign. Beautiful. Precious. Just what our room needs. Thanks for sharing! A truly lovely transformation! It's amazing how colour can deeply affect the mood! Your finishing touches are beautiful! LOVE LOVE LOVE! Absolutely stunning! Love that sign and need to redo my master too. Love the makeover and love, love, love that sign! Love your room makeover. I would love to win the sign! LOVE your bedroom re-do!! The colors, the decor...fabulous!! That is quite a change and it looks fantastic! Love that sign, the pillows ~ can't wait to see/hear the details. Wow, this is inspiring! Our bedroom has looked the same for probably 8 years (sad)...I'm warming up to a redo and LOVE your color! Your room is beautiful. The barn doors are spectacular. And I am always a fan of black and white photos, so elegant. I think that is what I love best, it's elegant with a touch of rustic (masculine touch). LOVE all of it! 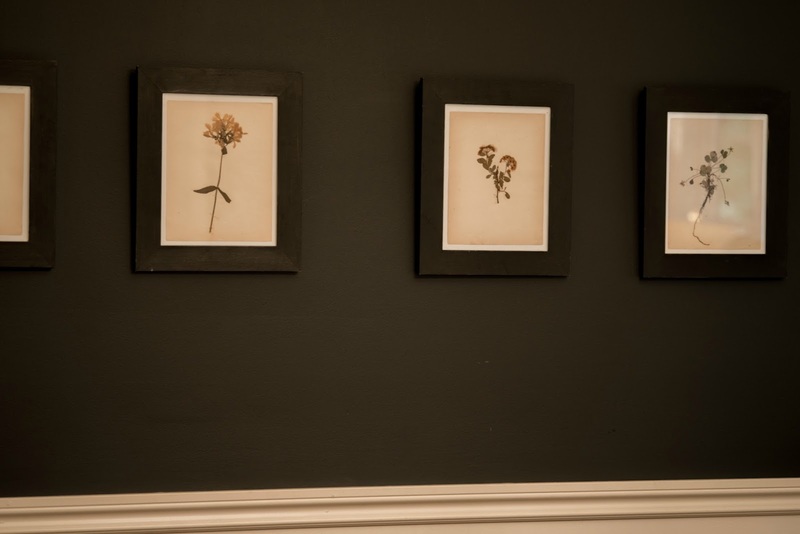 Am in the process of deciding on paint colors for our master bedroom- will come back to find out the deets! Lovely! My eyes immediately went to that sign .love it ! I've been looking for something new to hang over our bed . Love everything about your entire house. Beautiful!!! My husband and I met when we were 16. After high school and college, we married and celebrated our 36th this year. This sign is just perfect for us! Wow, what a gorgeous transformation! I love, love, love the new bedding! I'm dying to know where you found it! Gorgeous...can't wait for all of the details! Absolutely BREATHTAKING!! I love it! Love, love, love this room! Can't wait to read all the details. Love love love that sign!!!!! room looks so cozy. Thank you for the giveaway. Love that sign!!! Your master room looks beautiful!! 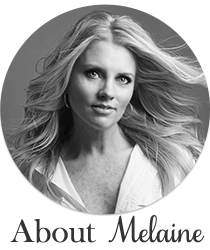 Loooove the makeover and your blog is great!! Thanks for sharing!! I love your room! My mater bedroom has been so neglected. I would love this sign to redecorate and make it a room I actually want to be in. I need bigger night stands too! Love your new space. I absolutely love this bedroom! The bedding is amazing. Wow! WOW is right! That room is a piece of heaven. Can't wait to get all the details. And when are you going to have more items in your Etsy shop? You room is simply stunning! You would be impressed... when I asked my sweet hubby to pronounced your name he just looked st it for a second, looked back up at me and then promptly pronounced it correctly!! Beautiful room! I love that color on your walls! Love the sign as well. Beautiful room! And the sign is a wonderful compliment to your relationship. The room looks fantastic!! Can't wait to hear all about it tomorrow! Fab! What a beautiful master bedroom! I love it and the sign above your bed. Thanks for the chance to win! Your bedroom looks so chic!! Very nicely done. 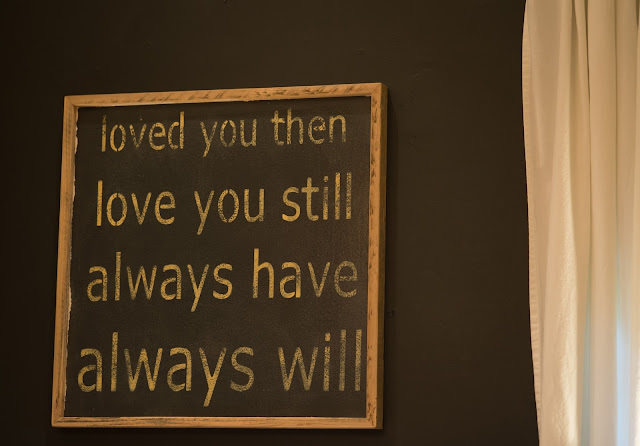 I also love the sign above your bed, very nice touch as well. Stunning maker over! Color made a huge impact in the room. Such a lovely, cozy room! Thanks for the giveaway! !